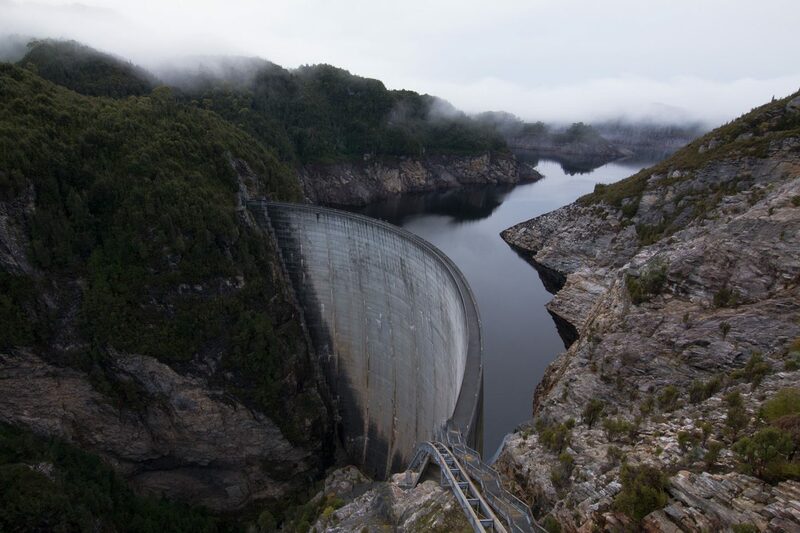 The mighty Gordon Dam is located in Strathgordon, Tasmania – about 2.5 hours West of Hobart. After spending our arrival day checking out Hobart, we made the drive out to the Pedder Wilderness Lodge that night. This was not the best idea, as it was incredibly misty and we had to be super careful for kangaroos jumping out onto the road…anyone who lives in Australia knows that you do NOT want to hit one of these guys…your car will come off second best! Up bright and early the next day, we drove 15 minutes down the road to meet Macca from Aardvark Adventures, and immediately we were getting our safety gear on ready to tackle the world’s highest commercial abseil! I have not abseiled before, or even really been rock climbing (much to my brother’s disappointment)…no, those two visits to RockSports don’t really count when you’re talking 43 STOREYS. My logic was, I’m going down the wall, not up – she’ll be right, mate! 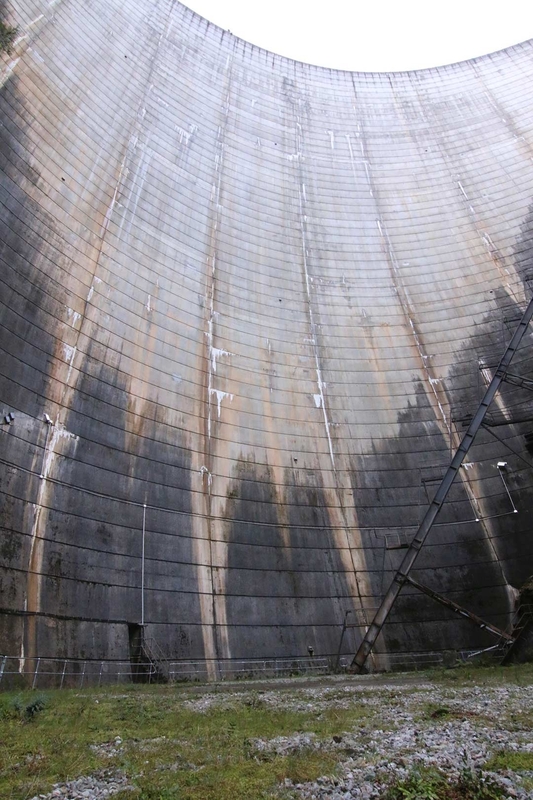 Helmets and harnesses on, we stepped out into the 3 degree Celsius air and squinted through the morning mist to the stunning views out over Gordon Dam. Stepping up to this mighty sight was breathtaking. Peering over the railing at water 47 storeys below is a strange feeling as your eyes try to adjust to the distance, and your brain tries to comprehend why the hell you want to jump over that railing?! I led the 4 climbers towards the 4 flights of stairs we needed to descend to get to the platform we would be abseiling from. The stairs were like metal grates and you could see straight through them. Now, I’m certainly not afraid of heights, but these stairs really played with my head. My eyes were focusing on the rocky ground and water you could see way down below, and as a result, the perspective was throwing off my balance a bit! I actually held on to the railing – but not quite at tight as the poor wife of one of the climbers, Ben, who was petrified of this ridiculous activity her husband called ‘fun’. Ben was first up, then my friend Cass, and finally it was my turn. Without hesitation, I threw my right leg up and over the railing and stepped across to finish being harnessed up. Thinking back now, it actually surprises me how much I didn’t think twice about hopping over that railing. I did have the safety harness on, but not all the other straps you end up being attached to. I turned my head and looked straight down. The mighty dam bowed out before my eyes. Then, it’s all up to you. You are not lowered by a professional standing above you. There is no machine that slowly lowers you 43 storeys down. It’s all up to you. 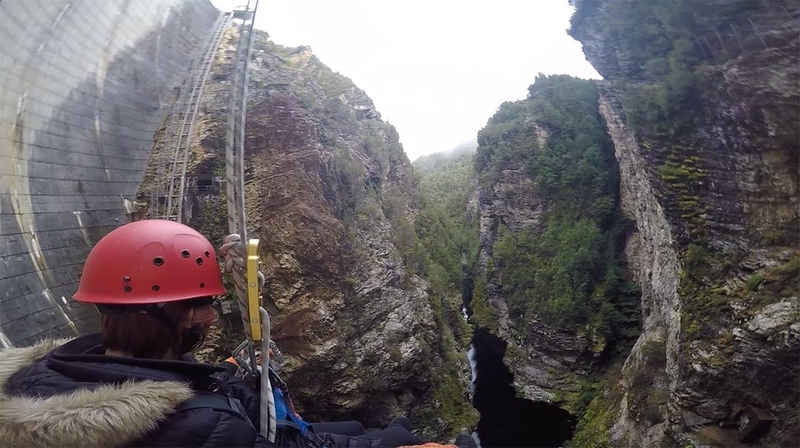 So, with my GoPro tightly tucked into my jacket front, I slowly released my grip on the rope and dropped away from the railing – the last thing I would be able to grab onto until I touched down at the base. 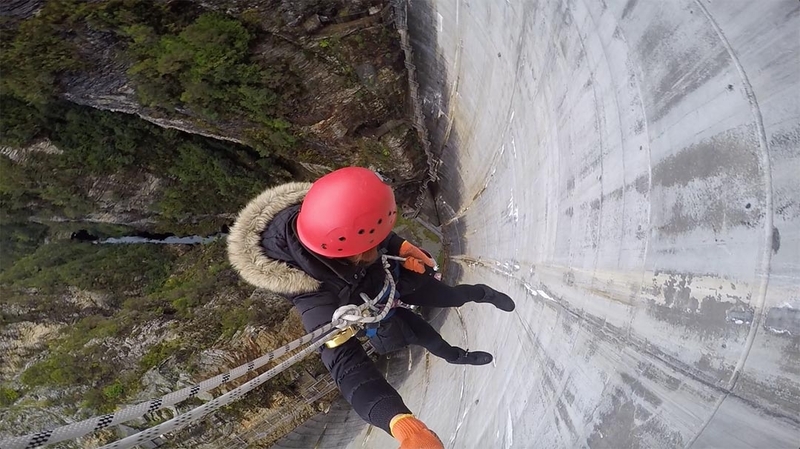 After a few metres in, you feel your legs stretching out further and further until you can no longer even touch the Dam wall as it’s bowed out. Then you’re just hanging there, in mid air, fully in control of wether you will plummet to the ground. I’m sure Macca had my back with the safety rope, but he made it very clear to us not to let go. Once my feet couldn’t touch, I turned myself around so I could look out over the incredible view in front of me. The fog was lifting as the sun began to raise the temperature a degree or two, and it was completely silent. There’s not many times in our lives where we can experience silence. At that moment I was completely relaxed. I held the rope tight and stopped for a while just taking in the moment. I looked out across the horizon, and looked down at the ground way below. It was time to pick up some speed again! I reached the bottom safely and took a look up at the monster wall in front of me. I felt accomplished! An amazing experience I wouldn’t have had in everyday life – this is the reason I travel! 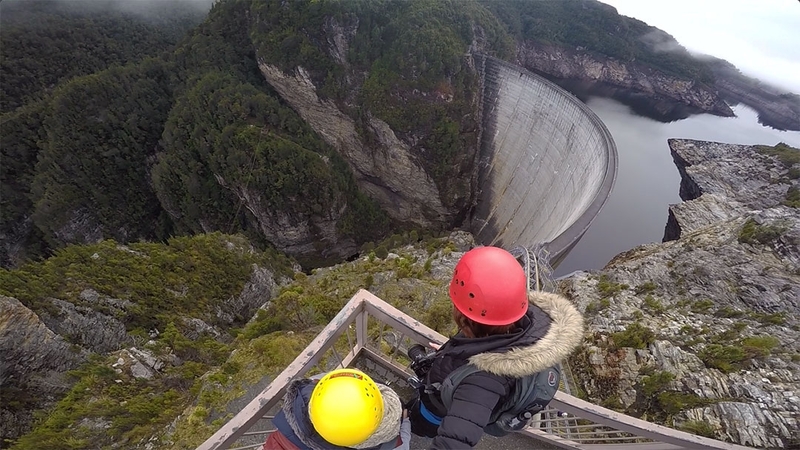 Have you abseiled Gordon Dam? Or anywhere spectacular around the world? 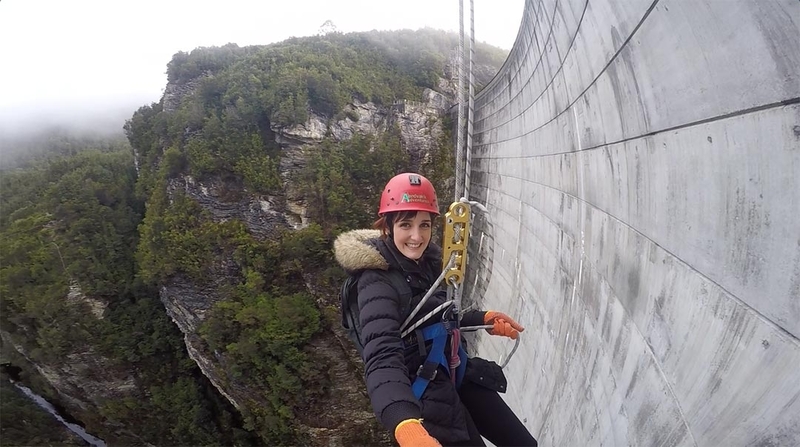 Have you seen this – I’ve also rafted the highest commercially rafted waterfall in the world! Click here for more details! oh man, I really admire your bravery. The pictures are absolutely stunning,but I wouldn’t be able to do what you did. I would be so nervous on the climb up. 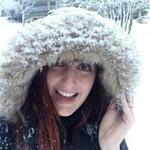 Great photos and video! I don’t think I would be able to do that but looks like you had a blast!